A £4.5m redevelopment of an Oxfordshire shopping precinct is not attracting new customers, traders have claimed. The Abbey Shopping Centre in Abingdon was refurbished over the past year but some shop units remain empty. The Chamber of Commerce said footfall had failed to recover after it went down during a year's worth of construction at the site. 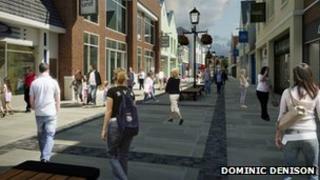 New River Retail, which manages the site, said it was confident it would attract a "major high street name". Bookshop owner Ian Collet said many shoppers went to Didcot, Witney or Oxford when the redevelopment work was going on. "We were a building site for 12 months. Although the customers stayed loyal, we lost footfall. "It looks lovely now but its easy to lose a customer base, not so easy to get it back." Martin Hughes from New River Retail, which managed the revamp on behalf of owners Scottish Widows Investment Partnership, said the area's difficulties reflected the economic climate. "We've seen a really nice upgrade of the town centre. It's quite challenging in the retail market and these are difficult times on the high street. "We are in advanced discussions with a major high street name which would entice other retailers to fill empty units." Mr Hughes added he was confident of a positive future for the area. Jill Carver, of the Chamber of Commerce, said shop owners would have to "pull together" to revive business. "We have seen a drop in footfall which has affected the whole town. "It looks really nice now but we did live with a building site - we need more promotion and to get the units filled."